Place beets, ginger salt and water in jar. Stir with a wooden/plastic spoon until the salt is dissolved. Place the jar in a dark area. I usually place mine in a cabinet or wrap it in a towel. 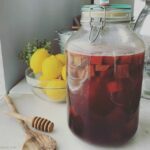 Allow the kvass to ferment for 3 days – two weeks. If I'm not in a rush I ferment mine for two weeks. When the kvass is ready, strain the beets and set them aside. Pour the liquid into a clean jar with a tight fitting lid or swing top bottles and store in the fridge. Optional: Use the beets for one more ferment using the same recipe and 1/4 cup kvass as a starter, then discard them and start with fresh beets. * If you’re using a jar without an airlock you will need to “burp” your jars periodically, otherwise carbon dioxide levels can build up within your jar and create pressure. Check the metal lid every day – if you can’t push it down simply unscrew the lit a bit and then immediately tighten it back down. Using an airlock which allows the gases to release eliminates the need to burp your jars.